Maximize and simplify kayak storage with wall cradles. These heavy-duty steel cradles hold up to 150-Pounds. of kayak securely with no need for straps. Simply drop your kayak into the cradles for worry-free storage. 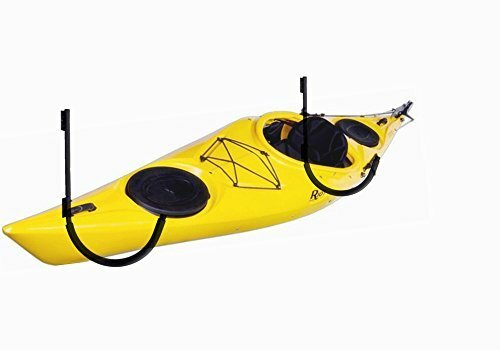 The 13-Inch wide cradle holds your kayak in place while the foam covering protects the finish and prevents slipping. Cradle installation is quick and easy, just mount the cradles to wall studs. Mounting hardware included.We offer lifetime warranty service and 100% full refund unconditionally guarantee! 150 lb Weight Capacity. Easy to install and easy to use，very easy installation. It can be hung on the wall of garage or room, which is neat and functional. It can be used not only to hang kayaks but also bicycles or other scattered goods. Size of each hook is about 24.8" x 15.7" x 13". We offer lifetime warranty service and 100% full refund unconditionally guarantee!